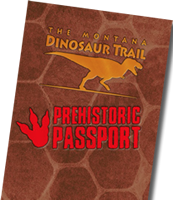 The Montana Dinosaur Trail – Go back in time – millions of years back! Welcome to the Montana Dinosaur Trail! This statewide trail runs across Montana and consists of 14 locations from the Two Medicine Dinosaur Center in Bynum to the Carter County Museum in Ekalaka. Each location offers a glimpse at the historic discoveries in the state and provides visitors with a better understanding of the giants that once inhabited our planet. Dinosaurs present the unknown – they ruled our planet for over 100 million years, and yet we know so little about them. Unlike lions, tigers and bears, we cannot simply drive down to the local zoo to study these massive creatures. Rather, we have to take a trip back in time and – piece by piece – put together their stories. It is our innate curiosity that has driven us to study these creatures. In Montana, we are privileged to host some of the richest dinosaur fossils, and the state boasts some of the most important discoveries and renowned paleontologists. As you explore Montana Dinosaur Trail museums, watch for these icons which indicate activities that are available at each location. A Montana Dinosaur Trail location with unique paleontology displays, interpretation, replicas, or actual skeletons of dinosaurs and other fossils found in Montana. A facility that provides public/visitor education programs and/or guided tours of the paleontology displays associated with the facility. These may be both regularly scheduled or available upon request. A museum that operates or is formally affiliated with organization(s) conducting paleontology field digs which are open to the public. Adherence to the Society of Vertebrate Paleontology Bylaws, Article 12: Code of Ethics is required.